Often times, an anime will try to deliver a message that resonates with real life and it does so by disguising the theme within something surreal or reality defying. 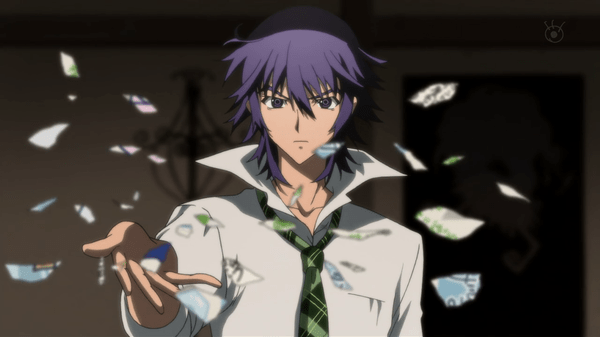 Shiki is one of those animes that accomplishes this and it does so by sending a message of self-reflection to its viewers. Honestly, this was an anime I was considering on dropping at the beginning because of its slow initial pacing and its inability to advance the story. To have done so would have been a grave mistake on my part as this became one of my favorite contemporary animes. So how did this show sway my opinion? Well.. let’s answer that with a review! In the quiet secluded village of Sotoba, something has been killing of their residents. Many felt it was a form of the plague and the town’s head doctor aims to discover the cause of this alarming illness. This illness began when a wealthy family bought a mansion on top of Kanemasa Hill, which overlooks Sotoba. This family struck the town as very strange as they mainly kept to themselves and were rarely seen out in public. The doctor’s findings; however, discovered something far graver than an illness. Those newcomers just happened to be vampires and they were using the town as their personal food source. Those who are killed have a rare chance to rise once again as vampires. So this is a show about vampires – at least at first glance. As the series progresses, this show manages to play with and manipulate your emotions on so many levels. In the beginning, the show depicts the vampires as the evil presence that must be vanquished from the world otherwise the entire town is going to die. You feel sorrowful for the humans who lost their loved ones and are stricken with sorrow and grief. Then.. something happens. Humanity reaches a breaking point… and coupled with meeting Sunako, the 13-year old vampire that moved in with the family, your emotions do a complete 180. Sunako tells the story of the vampires through a child’s innocence. She explains that her kind are raised like humans. They can’t help that they are vampires. Just like humans slaughtering innocent lives for food, the vampires also need to eat or they die. This makes the vampires seem humane and it delivers the message that the vampires are simply doing what is necessary to survive. Sunako’s innocence comes through as she doesn’t understand why their methods… why their desire to live like anyone else, is so hated and despised. When you add in the savagery of humans and the lengths they will go to protect their town, you honestly feel disgusted. It shows how humanity can be level headed at one point and then completely insane and irrational. Brutally driving stakes into the hearts of vampires and even running over their heads with a tractor shows the dark, ugly side of humanity. You actually feel sympathetic for the vampires and you want to see them win in the end. It’s a grim reminder of what we, as a society, are capable of in our darkest hours. That’s what I loved the most about this series… the depiction and symbolism built into the actions of the characters. Speaking of which, let’s dive into them. This is your main protagonist of the series. He is the dean of medicine at the town’s only hospital, which is about the size of a small clinic. He’s the one who investigates the mysterious deaths of the villagers and ultimately discovers the truth behind them. The sad thing is… he is powerless to do anything to try and stop it because none of the villagers will listen to him or believe a word he says. Because of this scruffy appearance, many attribute his explanations to overexertion and the inability to think straight. Through Ozaki, we are introduced to the stubbornness and ignorance of humanity, which is the catalyst which brings about the decline of social order in this show. There’s only one person who has an interest in Ozaki’s findings, and for good reason. Here is your other main protagonist. He’s the one who believes in Ozaki and even offers assistance where he can. He comes from a big city and hates living in the country. His only goal is to find a way to leave the town, but in the end, he ends up trying to save the town from the Shiki. The unique thing about Natsuno is he is turned into a Shiki by his friend Tohru, however, he doesn’t fully turn. He can also exist in the daylight and has become more of a werewolf than a vampire. One would think that he would serve as a bridge or a neutral party between the humans and the Shiki, but he is more or less a rogue who has his own agenda. He, too, wants to see the Shiki destroyed, but he’s not like other humans. He only wants it for personal reasons and mainly because of Tatsumi, who I will touch upon in a bit. Seishin is a unique character that you love to hate. 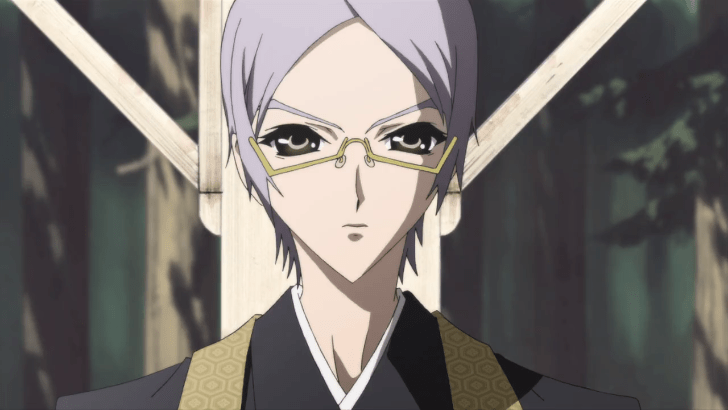 He is the town’s head priest and he shows compassion to everyone, including the Shiki. You’d think he would remain neutral because of this, but he ends up feeling sorrowful for Sunako when he hears her tale. When the time comes for the villagers to strike back against the Shiki, Seishin betrays humanity and ends up protecting Sunako… at least that’s what you believe. Once you start to feel for the Shiki rather than the humans, you come realize that Seishin’s reasoning was correct all along. Seishin is that gateway.. that bridge between the humans and the shiki. This character really took you through a rollercoaster of emotions from acceptance, to pity, to anger and hatred, to understanding and finality. I think he is the most balanced character in the entire series. 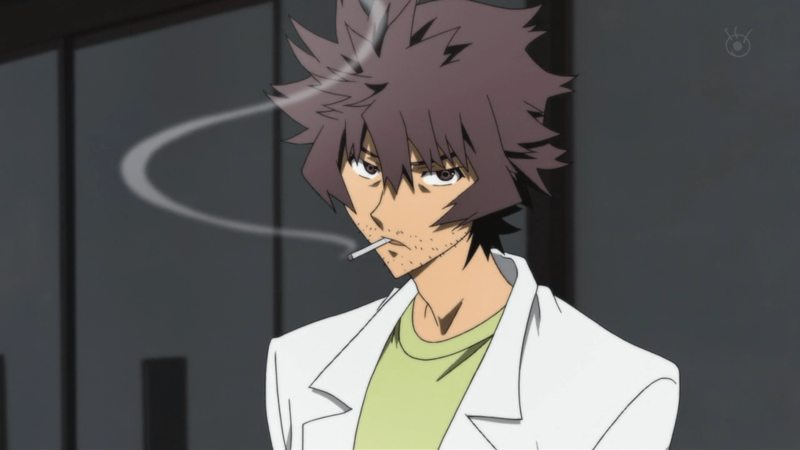 Thought to be the main antagonist to the series, he’s more or less the gateway into the world of the Shiki and a brilliant character to introduce the world to them. Tatsumi is a special kind of vampire.. he is known as a Jin-roh and can withstand sunlight, unlike the other vampires. He’s the one who makes public appearances for the Kirishiki family. He gives off a happy-go-lucky attitude mixed with a lot of snarkiness and confidence. He is very strong and extremely hard to kill and it’s because of his attitude without knowing the truth that you begin to feel the hatred for the Shiki and sympathy for the humans. Even when you start to feel for the Shiki, Tatsumi remains as a character that you love to hate. She is the 13-year old girl I spoke of before. She was bitten by a Western noble vampire and when she turned, she was shielded and protected from the world when her parents disappeared. She later discovered the truth, on a journey to find them, that her parents had died. She moved to Sotoba because she loved Seishin Muroi’s writings and wanted to visit him. She served as the emotional connection between the two of them and even bit Seishin to turn him into a werewolf. She was protected by Seishin during the war against the Shiki. She is also the pinnacle character that gets the viewer to side with the vampires, rather than the humans. I think without this character, there would be zero impact. While there were many characters in this show, these five were given the most attention, but all of the minor characters from the nurses at the clinic, the townspeople, and everyone in between, all had their own distinct personalities and contributed to the overall story very well. In fact, there were a couple of OVAs that came out that could be seen as nothing more than filler as it focused on the stories of some of the side characters during different points in the main story, but with the way those characters were developed and handled, it didn’t seem like filler at all, and it continued to enhance the emotion behind the story. Character Development is one of this anime’s strong points. When you have a great mix of characters on top of an engaging and emotional overarching story, you know you have a hit on your hands! The art for this show is really unique… especially the eyes of the characters. The eyes in this show are rather large and sharp-edged. 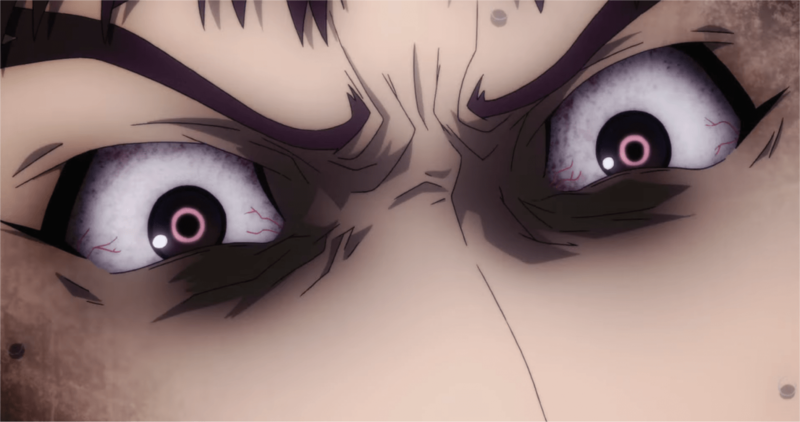 The pupils and iris of the eyes are also something you don’t typically see in anime, either. They have the standard color for their iris, but they also have a brighter ring of that color around the pupil. 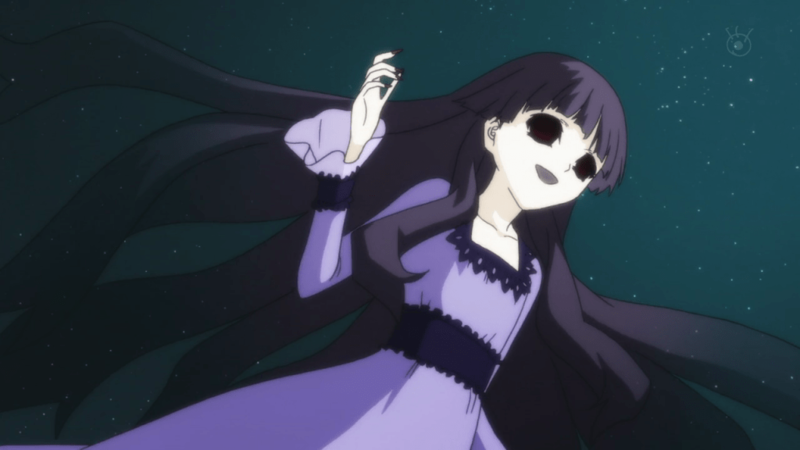 Plus, when you look into the eyes of the Shiki, they become black and featureless, almost as if you’re staring into the window of a soul that doesn’t exist..
Each of the characters have a very distinct look to them… some of them even have some of the most outrageous hair styles…. 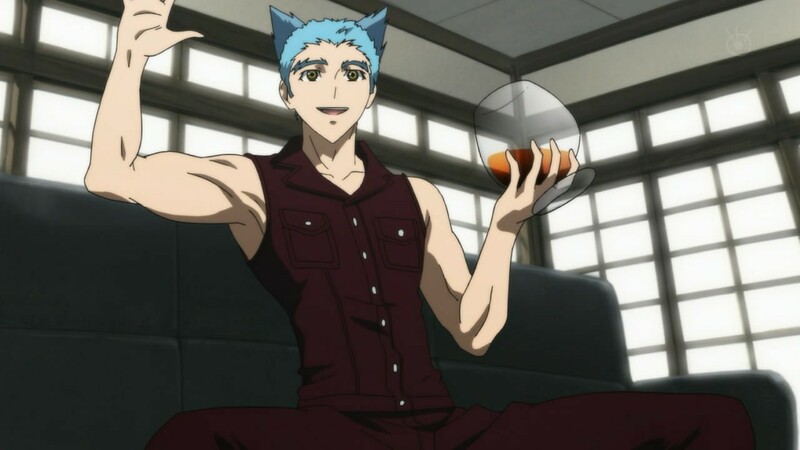 and Tatsumi? Those eyebrows, man… those eyebrows! You should have no trouble identifying which characters are which and their overall appearances really enhance what kind of character they truly are. It’s almost as if the characters were designed based on personality and emotion rather than just to have something that looks good. The animation is something that you would normally expect out of an anime. There are some points which seem fluid and others that seem normal. What really stands out, though, are some of the CG textures they use. Usually depicting the eyes or even sometimes, the hair. You can definitely tell where CG was used as a layer on top of the characters. It doesn’t blend well and looks a bit out of place. Other than that.. everything looks pretty detailed, the backgrounds are well done and draw you into the settling as they should. The story is highly engaging and you can feel for the characters on both sides at different points in the story. I love the opening and ending themes. 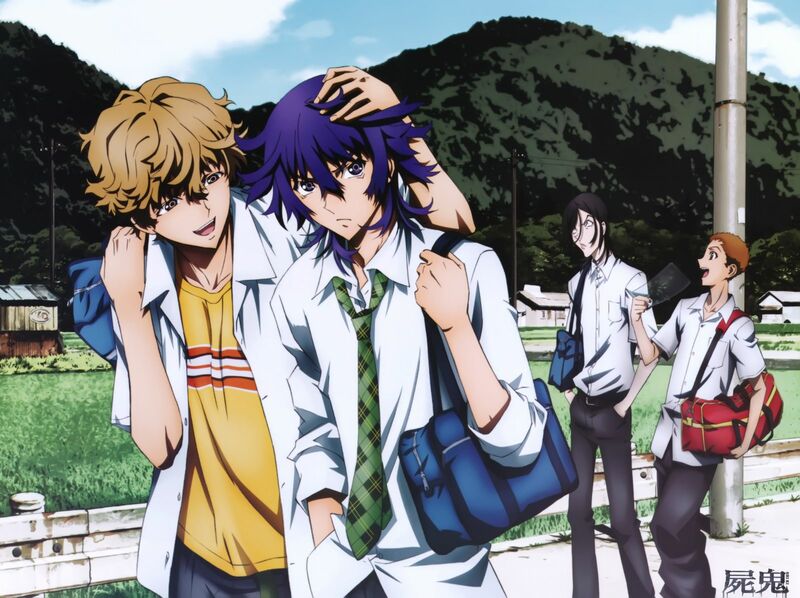 BUCK-TICK provided the first opening as well as the second ending. The second ending, “Gekka Reijin” is hauntingly beautiful as is the second opening “Calendula Requiem” by kanon x kanon. Those opening and endings really drive home the emotion this show brings forth and I highly recommend listening to those songs. As the series progressed, I found myself at the edge of my seat every week. 23 minutes seemed like it hadn’t even passed and when an anime can do that to you, you know that you’ve got something special on your hands. Should you watch Shiki? YES! An amazing murder mystery show based around vampires that slowly burns the story of humanity and how we easily fall in our darkest hours.